Discussion in 'The Lounge' started by r464, Jan 10, 2008.
so is it last man standing wins or first to be smart enough to not do it wins? Is that an annie lennox cover band? Could someone explain what the natrual selection part of the picture is?? The strong (and/or intelligent) survive. The weak (and/or stupid) take themselves out of the gene pool. Gene's pool is apparently a severe Belgian electrocution hazard in this case. Euro electricty is different, I guees it is also waterproof. 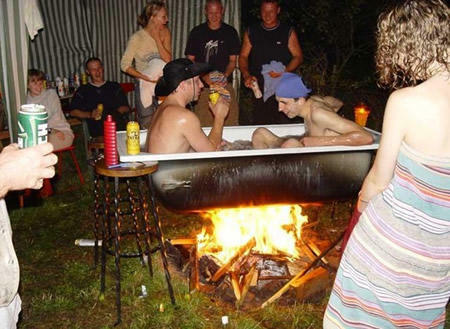 They should stick to hot tubs.. It was a joke dad.